Italy's Jollypunch Games has built a unique brawler called Fly Punch Boom! and will be showcasing the game during Indie Prize at Casual Connect London. Italian game developers have been fighting both the government and public perception in an effort to grow the local industry, according to Thalita Malago, secretary general of the AESVI (the video game trade organization in Italy). There's no denying the country's talent, however, and Casual Connect's Indie Prize is happy to boost that rising talent. Each Indie Prize welcomes winners from partner events across the globe, and one of the latest comes from Gamerome 2018. 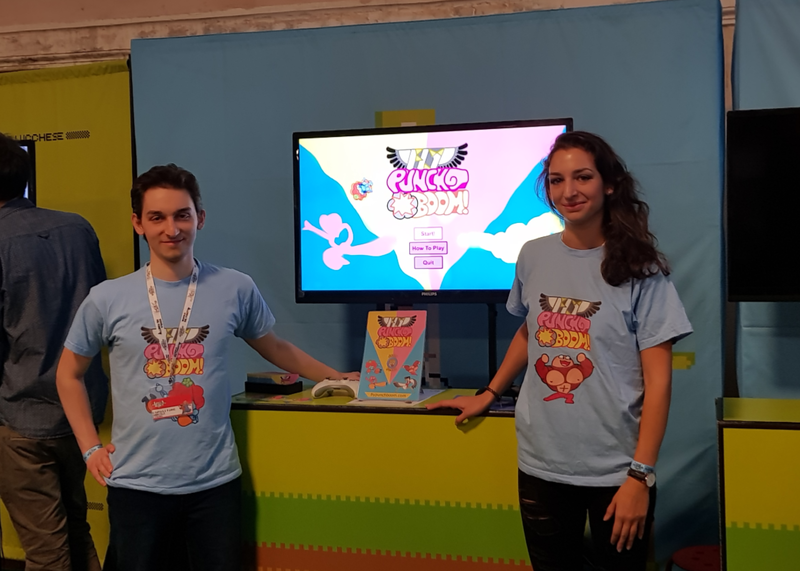 Gamerome’s jury honored the best indie game in its Developers Showcase, Jollypunch Games' Fly Punch Boom!, with a Special Indie Prize Award, meaning the developer is granted a pass to come to a future Indie Prize of their choosing. Jollypunch opted for Casual Connect London, running May 28-30 at the Queen Elizabeth II Centre. As many anime fans can attest to, the action scenes from popular episodes can be a feast for the eyes. Jollypunch wanted to replicate this sort of action-packed style with its fighting game. The quirky characters and stylized visuals come together to offer players an experience unlike traditional brawlers. GameDaily recentrly had a quick chat with Gabriele Libera, the sole developer of Jollypunch Games. Libera is hopeful that Casual Connect London will help spread the word on Fly Punch Boom! and gain Jollypunch some attention from publishers. Tell us about how you founded Jollypunch Games and where the inspiration for Fly Punch Boom! came from. Jollypunch Games is a one-man studio based in northern Italy. I first started trying my hand at making games in 2015. I was in Beijing, I just finished my PhD thesis and had some time before the dissertation. Unity and Unreal just went free. I’d been playing games since I was a kid, when my father owned a Commodore 64. [I have] loved games ever since, so I thought: “Let’s try this out. What could go wrong?” It was supposed to be a bit of short-lived fun, but I haven’t been able to tear myself away. Four years of hard, passionate work later, my first game is finally about to be released. My first project was a side-scrolling beat ’em up, one of my favorite genres. After a year of work, it became clear it was too ambitious for a first solo project. One day I was watching Kung Fu Panda 3, and those dynamic fight scenes gave me the inspiration for a new kind of fighting game… A game that could let players fight like in the most over-the-top anime scenes, where the environment is interactive and can be destroyed or thrown against your opponent, and the scale of the battles can go from space to a character’s face in an instant, without cuts in the camera work. That’s how Fly Punch Boom! was born. What do you hope to gain from the experience of Indie Prize London? A lot of what [Indie Prize director] Yuliya has said about the spirit of the event has resonated strongly with me. Independent development can be a solitary pursuit, so events like these are one of the best ways to connect to all kinds of people in the industry. I’m really looking forward to meeting like-minded devs on one hand, and people more experienced with the business side of things on the other. I’ve had a similar experience at GameRome, and it was very valuable. I’m also looking for a publisher that can fulfill Fly Punch Boom!’s potential. And of course, [I want] to let as many people as possible know about FPB! What is your development process like? How often do you test, what tools do you use, and who have you partnered with? Design, art and code are all handled by myself (Gabriele Libera). The music was composed and recorded by the super talented Giorgiost (Jorge Olivares), who created a truly kickass anime OST. I listen to it all the time, and the game wouldn't be the same without it. The sound effects were created by NoobSound (Mattia Cozzi and Matteo Giovanardi), who worked very hard to make the game feel as it does now. FPB! is developed in Unity, with the help of tools like LeanTween, Steamworks.NET, and LiteNetLib for online testing. Casual Connect Europe in London will be welcoming 91 lndie Prize participants. They will be announced soon on the official website. Greenlit Content, parent company to GameDaily, owns and operates the Casual Connect event series.